In all of our blogs and web sites the Greenteeth team have been critical of those science fans who are turning science into a religion. Scientists deny this of course even in the face of the evidence. Here Ian R Thorpe shows you that the idea of mathematics as God is nothing new, it has been around longer than Christianity in fact. Marcus du Sautoy, Mathematician, Professor for the Public Understanding of Science (having succeeded Richard Dawkins in the Chair) last year presented a series of TV programmes about mathematics and nature entitled ‘The Code’. Advance publicity for the show led potential viewers to believe Prof. Du Sautoy would be presenting a mainstream view of mathematics in an attempt to demonstrate the subject is not really as difficult or nerdy as people think, rather than promoting his own very nerdy version of atheistic metaphysics. Du Sautoy is not so much a mathematician, he's a maths geek. It's laughable. Cats catching their prey, dogs catching a Frisbee in mid air and horses taking a fence so high they cannot see the ground on the other side would also have to do equations, not one but many. And if Wayne Rooney does not seem capable of such a mental exercise those creatures certainly aren't. Few of us are taken in by Du Sautoy's hyperbolic overselling of mathematics. Having read articles and essays Du Sautoy has published, he seems to be a rather cranky academic who is totally besotted with his specialist subject. In his published work he has made such outrageous claims as because music can be mathematically analysed, without mathematics we could not have created music and that the Universe is constructed according to a very complex mathematical design (nothing outrageous about that you might think but he and his supporters deny this is just a version of intelligent design, dismissing intelligent design as religious nonsense). Du Sautoy’s view of the physical dimension is that, as the Pythagoreans expressed it, ‘Number is everything.’ This is not as original as you might think, in fact it has been around since the ancient Geek Pythagoras (570 - 490 BC) floated it as an answer to the religious and naturalistic schools of philosophy. Pythagoras was a scientist, a mathematician in fact, so as far as Marcus Du Sautoy is concerned, QED. The idea that everything emanates from numbers and mathematics is clearly as undemonstrable as the Biblical creation story or Big Bang theory. This should make the proposition anathema to a mathematician and identify it as a faith-based religious concept. Philosophers of mathematics and informed students of mathematics know that there is, to date, no satisfactory understanding of the relationship, if any, between mathematics and reality; to suggest that there is a relationship, and what such a relationship might be, is an act of faith. And yet, more and more we see, especially among theoretical physicists and mathematicians (and of course among the Climate Science lobby who base their studies on mathematical models rather than observations of reality) that "Science" is becoming more and more like a religion. It is very unfortunate that scientists working with speculative mathematics are behaving as though mathematics is the original reality to which the physical world ‘must’ conform through such things as ‘laws’. Science has been hideously corrupted in the last 80 years because of this and further corrupted through it's becoming a branch of government which has brought into it an element of The King's New Clothes". It is not politically expedient to question science. Many Christians will be delighted to see and hear Du Sautoy suggesting that numbers are at the root of all reality, this is in some ways adds a of kind of scientific endorsement to the theory of Intelligent Design. However Du Sautoy is an avowed atheist who says he intends to is take a more gentle approach to undermining religious belief than Richard ‘The Rottweiler’ Dawkins (whom all can see is a bigoted fanatic) and is not citing design, or even apparent design, as the basis of everything but referring to some mysterious entity he calls ‘The Code’. A code at the very least implies information content, but The Code (as a proper noun and with the definite article) suggests something unique and powerful. God? In his own words Du Sautoy puts it like this "…underlying everything that surrounds us, from the natural world to the cities we live in, there is a hidden code that explains why things look and behave they way they do. This hidden code (‘The Code’) has the power to unlock the laws that govern the universe. The Code is the truth of the universe, and its numbers dictate the way the world must be." So, this hidden code, this entity that Du Sautoy calls ‘The Code’ is identical to Absolute Truth, The Oneness, The Ancient Of Days, and can lead us to All Truth, and is completely deterministic. This is unquestionably a religious view of the Universe. In fact it is the old heresy of Pythagoras, the pagan Greek philosopher, re-worked by gnostics, Kabbalists, Freemasons, Rosicrucians, Illuminists, and now, it appears, New Atheists. What a great scam it will be if modern scientists s can pull it one off! Most people know very little about Pythagorean philosophy other than the Pythagorean Theorem of the triangle, which was attributed to Pythagoras, but was most certainly known and used for well over 1000 years before Pythagoras lived. The man himself however was rather more complex than a triangle and apart from believing that the universe and everything in it was made out of numbers and mathematical formulas he also never ate beans because he believed every time we fart a little bit of our soul escapes. Bertrand Russell, the twentieth century mathematician and philosopher, whilst unsympathetic to Pythagoras' view of the nature of things, stated. "I do not know of any other man who has been as influential as he was in the sphere of thought." Pythagoras and his followers believed that all relationships could be reduced to numerical equations, that mathematics (holos) is the true reality, while the world (cosmos) with time and space and all other manner of artifice is a nothing more than a construct of human minds. Pythagorean metaphysics stated that ‘The Essence of Being Is Number’, number being understood to be ‘that which prior to all things subsists…by which and from which all things are coordinated, and remain connumerated in an indissoluble order.’ (Christians will notice a usurpation of the divine Logos therein). The Pythagorean philosophy was dominated by the ideal that numbers were not merely symbols of reality, but were the final substance of real things. "…believed that the principles of mathematics were also the principles of all things that be. Now, since the principles of mathematics are numbers, and they thought they found in numbers, more than in fire and earth and water, similarities with things that are and that become (they judged, for example, that justice was a particular property of numbers, the soul and mind another, opportunity another, and similarly, so to say, anything else), and since furthermore they saw expressed by numbers the properties and the ratios of harmony, since finally everything in nature appeared to them to be similar to numbers, and numbers appeared to be first among all there is in nature, they thought that the elements of numbers were the elements of all that there is, and that the whole world was harmony and number." While pagans both modern and ancient, do not believe in their gods as followers of the Abrahamic religions, the Pythagoreans definitely believed in an omnipotent, omniescent God who is in fact a number or numeric code. 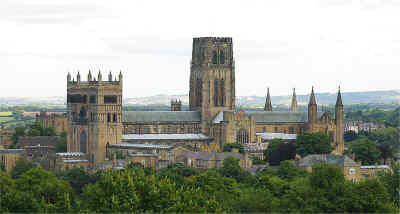 Allocated a generous budget by the BBC from funds generously but involuntarily donated by taxpayers Du Sautoy starts his series with an expensive jolly to Chartres cathedral, said to be first of the great Gothic cathedrals (in fact Durham Cathedral in north east England was begun first but not completed until after Chartres because of local problems about who was the rightful King of England. Chartres has become far more widely known in recent years thanks to a certain fictional work. In the Middle Ages the cathedral school at Chartres, like most of the religious communities, was the centre for learning and for a revival and development of Pythagorean ideas. The monastic orders were fiercely independent of the Vatican and openly defied Papal control freakery especially if it related to suppression of ancient knowledge deemed "ungodly" by The Holy Father. Chartes cathedral was built on the site of a Druid temple, the crypt beneath the cathedral being a dolmenic chamber. Diodorus Siculus, writing in 36 BC, describes how these Druids followed Pythagorean teachings although that is probably wrong - the Druids, like the Babylonians, Egyptians, Assyrians, Persians and Minoans were using Pythagorean mathematics long before Pythagoras was even a twinkle in his Daddy's eye. 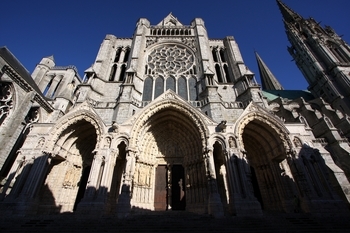 Thanks to such links to a mysterious era in human development, Chartres has become one of the main centres for people interested in the The Grail Mystery and certain lost arts and sciences. The cathedral contains a mass of Masonic, gnostic, pagan, astrological and Pythagorean symbols. As this stuff is the bread and butter of Dan Brown's The Da Vinci Code and the genre of revelatory fiction it spawned along with the speculative history books concerning The Holy Grail, The Knights Templar, Ark Of The Covenant, Freemasonry, Pagan symbols in Christian art and the secrets of the ancients perhaps Chartres was not the most helpful place to start a series that claimed it would reveal a great spiritual truth. "The masters of Chartres, like Pythagoreans of all ages, were obsessed with mathematics: it was considered the link between God and the world, the magical tool that would unlock the secrets of both." "…from the dawn of Western Civilization and through the Middle Ages the heart of mathematics was strongly tied to religious thought. Eventually, however, the humanism of the Renaissance and the empiricism of the Scientific Revolution began to open the door for the breakdown of this marriage. Scientism, the granting of absolute authority to the empirical and objective, became the mistress of the modern mind. The resulting ‘mathematization’ of science and culture (Howell & Bradley, 2001) had a myriad of consequences. The Church was no longer perceived as having a monopoly on Truth. The success of mathematics in accounting for the structure and behavior of the physical universe ultimately led to a naturalistic version of the Pythagorean ontology that ‘Everything is number.’ The divorce of theology and mathematics in the modern age created the 20th century crisis of ‘Foundationalism’ in mathematical philosophy…[and] epistemological progress in mathematics is devastating to Christian theology under the Pythagorean legacy." Stucki obviously thinks Pythagoreans mathematical theology still has followers; Du Sautoy, as we have seen, is one, but also an increasing number of physicists are being seduced into thinking that ‘the principles of mathematics are also the principles of all things that be’, that somehow mathematics is the primary reality or as some might say the supreme force of the universe. Another example of a scientist who has lost sight of reality is I. V. Volovich, a physicist at the great centre for wasting taxpayers' money, CERN. In his paper Number Theory As The Ultimate Physical Theory Volovich concludes that: " ... the fundamental entities of which we consider our Universe to be composed cannot be particles, fields or strings but numbers ..." Obviously the man is daft as a brush, numbers are a construct of the human mind. Numbers are what we use for accounting and measuring. Many things can be said to have divine properties but not abstract concepts like numbers. "That ‘all is number’ will allow us to create what many theologians thought only God was capable of…all can be numerated and computerized…Mathematics is the most basic requirement for existence. It has no mass, dimension and time and yet it can create these and many more phenomena. The Thales era which brought us science is near the end. It is to be followed by the Pythagorean era with…the realization that ‘all is number’…we will gain the vision that ‘all is mathematics’…This is the point that we begin to perceive our existence as numerical." The philosophy of mathematics is pure philosophy and not science as it's devotees like to claim, it proposes, but never resolves. Pythagoreans aim to cut through the debate between the Platonists and the Formalists, the Realists and the Nominalists by making both views redundant through asserting a radical third way, which aims to dominate the whole scientific enterprise. Platonists and Realists believe that mathematical entities exist independently of the human mind, abstract and immutable; apart from this material universe in which absolute mathematical truths reside. In this view, mathematicians do not invent mathematics but discover it. New mathematical concepts are "revealed". But if these entities are not part of this universe, how can they be discovered and recognized? The standard answer to that it is by intuition or (divine?) revelation and illumination, thus we have a dichotomy. The scientists who most despise religion embrace the methodology of the religious thinker as their own. Christians might be attracted to such a view, in that such entities ‘exist’ in the mind of God, (or somehow in God himself, who is transcendently not part of this universe but something which, as one of the gnostic gospels puts it, is so great the entire firmament is contained within it and yet so small it's whole is contained within the smallest thing. Formalists/Nominalists on the other hand deny the existence of mathematical entities, dismissing mathematics a purely a construction of the mind (whether the mind of man or the mind of God). In this view, mathematics is a very useful common language and tool that can help us try to make sense of the world, and can lead us towards beneficial discoveries and enhance our understanding, but which is for all that an artifice, a human invention. St Augustine had some interesting thoughts along these lines as well, that numbers are the universal language conveyed by God to us as confirmation of the truth. Realists and Nominalists are agreed that there are no mathematical entities within this universe, but Pythagoreans assert that mathematical entities are not only within the universe, but actually comprise the universe. This has been an attractive idea for atheist scientists who take a reductionist approach in their efforts to avoid answering the unanswerable questions that are food and drink to philosophers. If everything can be reduced to numbers, everything can be explained by an equation. Except Wayne Rooney's goalscoring ability of course, or how a cat times it's leap to catch a bird that is about to fly away, or how a monkey swings with such apparent ease from branch to branch among the trees while so many humans struggle to solve even simple equations. Realism then proposes that mathematical entities exist outside the reality of the physical universe. The connection, if any, between these entities and reality is an ongoing debate. Nominalism holds that there are no mathematical entities; mathematics is a product of the mind apart from reality. Pythagoreanism: asserts that there are mathematical entities within the universe, which constitute the whole of reality. All else is a product of the mind. St Augustine said, "If you see anything at all that has measure, number, and order, do not hesitate to attribute it to God as craftsman." With those things in mind, imagine the hysterical fury that would come pouring from the mouths and fingers of militant Atheists, if this TV series had been titled "Intelligent Design?" rather than the more cryptic "The Code." while highlighting the intelligence of the design underlying the patterns and numbers of which the universe is formed. ROTFLMAO. One of the many sources I used in researching this artilce, (The Language Of Life, Keith Devlin, The Guardian, September 2004)attracted this letter in response (the article was published before online commenting was available in the newspaper.) The misrepresentation, bigging up, of mathematics the writer refers to is something I see more and more often. Swcience is becoming a religion, with dogmas, a creed and fanatical followers determined to convert or silence all infidels. Letter to The Guardian in response to Keith Devlin's article The Language Of Life. As an engineer, mathematics has been an important part of my career but I have always been aware that it is a tool. In the past there have been many attempts to develop a 'philosophy of everything' base on mathematical speculations that took maths into areas it was never designed to go, areas of human thought and enquiry that rightly belong to philosophers. This talk of mathematicians being creative jarrs with me somewhat, inventors, engineers, designers are creative. Mathematics is just part of our tool kit. Why, in these days when the militant atheist supporters of Richard Dawkins and his fellow travellers are so ready to decry and belittle religiopus faith and claim science has proved God does not exist, do so many eminent scientists still believe in God, including a number who have made carers in science but are very active in their respectoive churces? At the risk of making to sciencyheads kick off about intelligent design we must enter the argument between science and creationism to pose the possibility that the universe did have a designer - not a god such as the creation myths describe but a race of intelligent (?) beings who, live ourselves could not resist meddling with things they did not fully understand thus incurring unforeseen consequences. Is It Time To Ban Maths From Schools? Academics and politicians are always banging on about how school pulpils have no interest in maths and science. They blame everybody but themselves of course. When you get down to it, maybe the way Maths and Science are taught in schools is to blame. Or maybe it is the nerds who teach it and try to infect pupils with their own irrational enthusiasm for the uttrly pointless that has made these subjects so uncool.